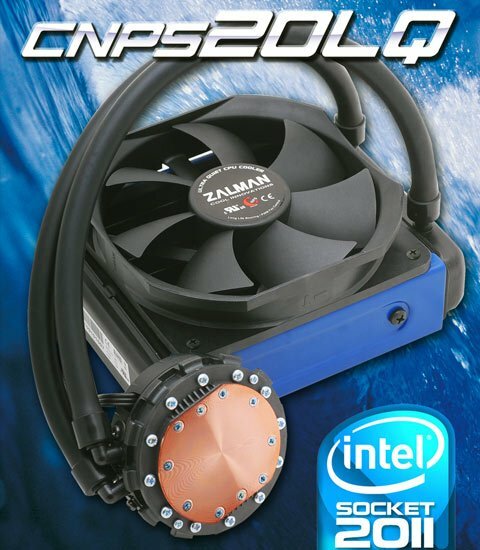 Legit Reviews got its hands on some more details about Zalman's CNPS20LQ, a new liquid cooling solution that will be revealed at next week's CES 2012 show. The product is anticipated to be launched for around $90, it's manufactured by Asetek and supports Intel's LGA775/1155/1156/1366/2011 and AMD's Socket AM2/AM2+/AM3/AM3+/FM1 processors. The Zalman CNPS20LQ is a self-contained sealed CPU cooler that looks very similar to the Corsair Hydro H70, Antec KÜHLER H₂O 620 and the Intel BXRTS2011LC. The CNPS20LQ uses a single-fan (dual-fan capable) radiator design. Its radiator measures 120 (W) x 158 (L) x 25 (H) mm, which fits standard 120mm fan locations. The water block houses a pump, which draws power from standard 4-pin CPU power header, and according to the specifications it does support PWM control. The base of the water block is made from copper and comes with thermal interface material pre-applied.